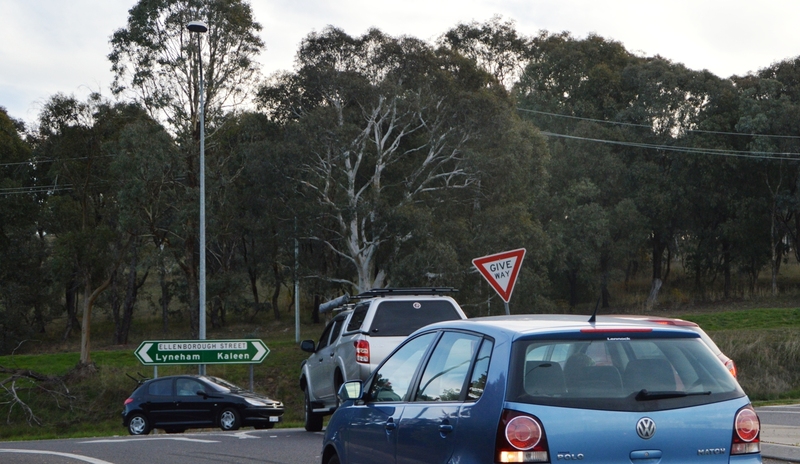 Funding has been allocated to fix seven notorious black spots on Canberra roads. The Federal Government last week announced that $891,500 has been allocated to fund the work in the 2017-18 financial year under the Federal Government Black Spot Programme. The work is aimed at reducing fatalities and crashes on ACT roads and focuses on areas that have a history of being dangerous. In the 2017-18 financial year, work will be carried out on black spot projects in Forrest, Kingston, Greenway, Tuggeranong, Isabella Plains, Braddon and Lyneham. Minister for Infrastructure and Transport Darren Chester said the projects were recommended under an independent process and that every dollar invested in safer roads helps to save lives. “Governments of all levels have made significant progress over several decades in reducing fatalities but, as the 7.9 per cent increase in the national road toll in 2016 indicates, much more work needs to be done,” Mr Chester said. “By investing extra money into fixing dangerous sections of road we are helping to make our local roads safer for motorists, cyclists and pedestrians. “The Bureau of Infrastructure, Transport and Regional Economics has found that, on average, black spot projects reduce fatal and injury crashes by 30 per cent. ACT Senator and Chair of the ACT Black Spot Consultative Panel, Zed Seselja, said the community would benefit from a safer local road network through the ongoing work to improve black spot locations across the Territory. “Residents will recognise the history and notoriety of each of these locations. Having specialised funding allocated to fix these dangerous spots is great news for the local community and everyone who drives on these sections of road,” Senator Seselja said. “The beauty of the Black Spot Programme is that it allows anyone to make a submission for a safety upgrade to a road or intersection in their local area. 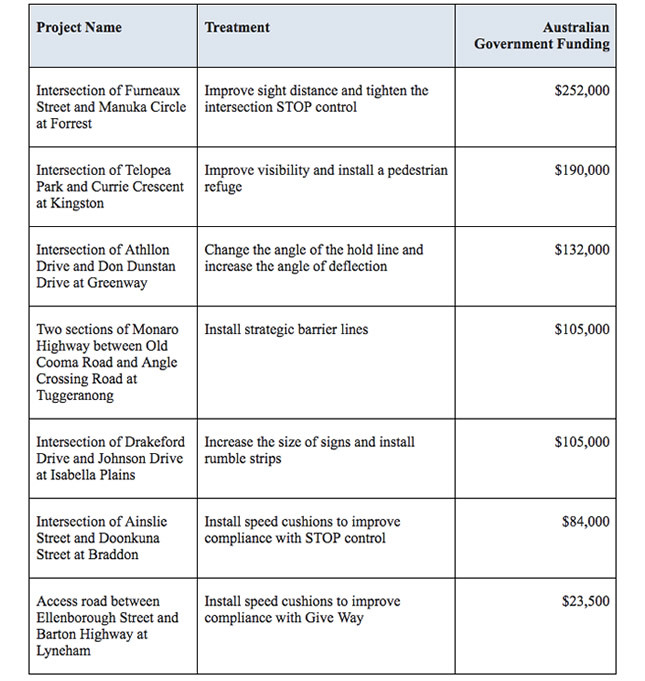 Anyone interested in nominating a black spot or finding out more about the programme should visit http://investment.infrastructure.gov.au/funding/blackspots/. Photo: The ‘black spot’ access road between Ellenborough Street and Barton Highway, Lyneham. Photo by Glynis Quinlan. What do you think are the worst black spots in Canberra? Have you had problems at any of the seven black spots that are going to be fixed? Let us know in the comments. I and fellow residents have been lobbying for traffic calming measures in our street, a popular inner north ‘rat run’, for years. Letters to ‘Fix My Street’ website and to relevant ministers have produced no result (unless you call a response telling you to write back in 60 days if nothing has been done a ‘result’). Also, how about literal ‘black spots’, i.e. the dark of our extremely ill-lit streets. Walking in some older suburbs on these autumn evenings is pretty hairy given the appallingly ineffective street lighting, the speed and carelessness with which some people drive and the badly maintained state of the footpaths. Good to see these are now getting addressed. I noticed they have finally started to install lights on Sternberg Crescent ,Wanniassa, a street that featured twice in the list of worst crash sites (has had three deaths over recent years) and it is a suburban road that sees an incredible “9,400 vehicles per day just on the section of Sternberg Crescent near the Erindale Shopping Centre”. That’s busier than some dual lane main roads in Belconnen. Some Tuggers riotactors might be interested in background on this road so see the links below. I am all for improving intersection safety but I am not sure how effective the measures will be for the suggested improvements at the Ellenborough/Barton Highway entrance. I am a regular user of this road, either on motorcycle or 4WD. It appears the main collisions between vehicles here are due to drivers turning right from Barton Hwy onto Ellenborough misjudging the speed and closing distance of vehicles coming doen the hill from Kaleen. I regularly get ready to either slow or even stop when approaching this intersection on my way from Kaleen to Nth Lyneham to avoid vehicles turning in front of me. Drivers stopped at the Give Way sign suddenly shoot out across Ellenborough often with less than a car’s width between them. When they get it wrong the collision occurs. By putting speed cushions on the Barton Hwy entrance road will not reduce these collisions at all as the cross vehicles have usually stopped anyway at the Give Way sign. Installing the cushions on Ellenborough may slow that traffic somewhat but as a motorcycle rider I would be concerned about the positioning of them on downhill corner. I would however be interested to see the statistics on accidents on the corner of Cowper St and Majura Ave.
Have just moved to the area and seems to be a frequent occurrence. This project sounds like a good idea. I also like roundabouts. Is it possible to nominate a potential roundabout to replace a traffic light or give way intersection? I have often been stuck at a ‘red’ traffic light with low traffic and thought to myself ‘a roundabout would fix this’. I note that speed “cushions” have recently been installed on Bugden Avenue Fadden between Nicklin Crescent and Coyne Street. They are a little bit wider than normal which stops the large 4WDs and busses straddling them. The distance between the sets is too far I believe. They also have a plastic fence between them so motor cyclists (and electric bike riders) , beware.